Running a business can be tough. Often as business owners we are trying to wear many hats and some of those hats just don’t come naturally. For me that hat is accounting and tax, it bores me to tears but it’s critical to business success which is why I have surrounded myself with an awesome external accountant who gives me complete peace of mind. Human Resources is a hat that many business owners aren’t that comfortable wearing. Some try their best but keeping up with legislation changes, knowing what you can and can’t say to an employee about a particular issue (so you don’t say anything at all), having the time to put HR policies, systems and processes in place and maintaining them all takes time. Valuable time and when the hat doesn’t naturally fit, let’s be honest…… we avoid, procrastinate or just put it in the too hard basket until it escalates and we are forced to invest the time. Some business owners want the peace of mind that they have the documents in place; that they are meeting their compliance requirements. Other business owners are having issues (some minor, some more significant) with their employees – poor work output, not following instruction, not doing the tasks they are required to do, excessive leave; the list goes on. The problem is, managing your HR is much more than simply putting in place processes and systems. You absolutely need to have these in place to set your business up for success and to help your employees achieve success but compliance alone won’t solve all your problems. HR is not a set and forget hat that you can wear. Your policies and systems are simply the foundation for HR success. If you’ve purchased a nice little folder of policies and documents that none of your employees know about or understand; if they are not living breathing documents they aren’t going to be of much value you to. They are only giving you a false sense of peace of mind and they are certainly not going to change behaviour. I’ve seen many small business owners sold generic or slightly customised folders of documents to manage their HR, but those resources in isolation don’t solve the real problems. 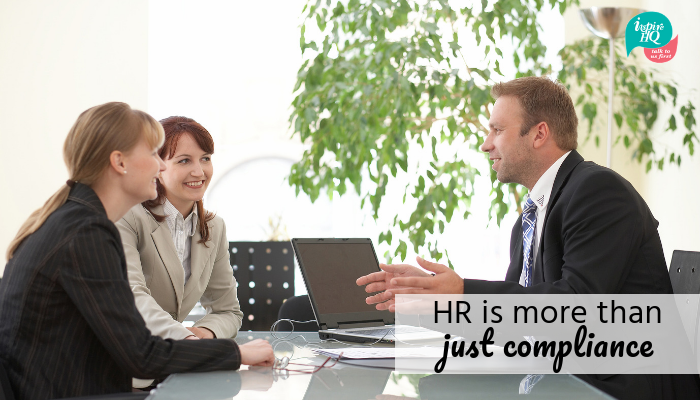 HR is more than just compliance. It’s more than having the right employment contract and a clearly detailed PD. It’s more than a glossy folder or intranet of policies and processes. You need to build on these documents and resources, day in and day out, to effectively manage your HR. HR is about people. It looks like understanding, listening, communicating (a lot), supporting, caring, involving, encouraging, believing and asking. That’s a big hat to wear all the time, but that is the reality. It’s these things that contribute to creating and driving your culture. As a business owner there are many benefits in outsourcing your HR but there will always be elements of HR that you will not be able to free yourself of for true HR success. Showing your employees that you and other leaders in the business care and listen and are genuinely interested in what your employees have to say is something that cannot be replaced by a HR Consultant or by outsourcing. A HR Consultant can give you the frameworks, develop and implement the systems, coach you on how to have the conversations, help you adjust your style to suit your audience or be a sounding board to bounce thoughts and ideas around with before you discuss with your team. A present HR Consultant will have a much better feel for your business than someone that is only available via the phone or email. A HR Consultant can support and demonstrate the understanding, listening, communicating (a lot), supporting, caring, involving, encouraging, believing and asking. However, when it comes to the crunch it’s these behaviours that when demonstrated by the business owner and the leaders in our business, are the most powerful. That’s how you will truly set your business up for HR management success.